There are so many types of chả in the Vietnamese food lexicon, it’s hard to keep track, even for us. 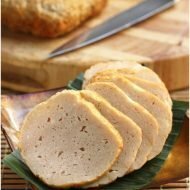 From a simple pork paste giò sống, the Vietnamese have elevated this humble mixture into variety of “hams,” if you will, with the most common being chả lụa, found in many banh mi, and to a lessor but still well known chả Huế, chả que, and finally chả ốc. 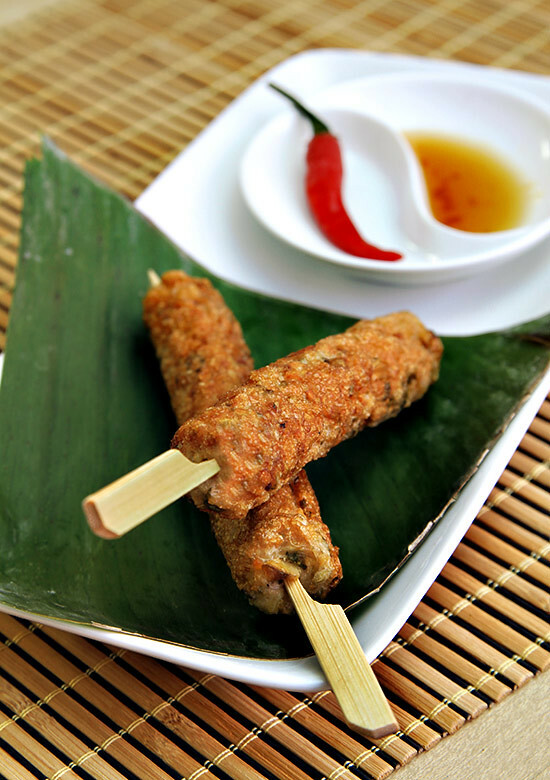 Other Vietnamese foods include the term chả in it as well, such as chả giò—Vietnamese egg rolls, simply because chả giò often contains a ground pork filling. 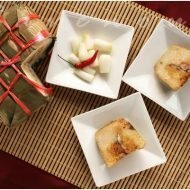 As previously mentioned, all these chả products are derivatives of giò sống, the multi-purpose pork paste that’s easy to make at home, or bought in most Asian groceries. One of these days we’ll have a recipe for all varieties of chả we listed, but for now we want to feature what’s most likely the least known, chả ốc. What we love about this Northern Vietnamese snack is the texture and fragrance. Small bits of chewy periwinkle or conch adds a great texture to what’s normally smooth bologne like texture of pork. Pork and Periwinkle, sounds like a name of hip new restaurant doesn’t it? You can find cooked periwinkle or conch in the frozen section of your Asian grocer as well. 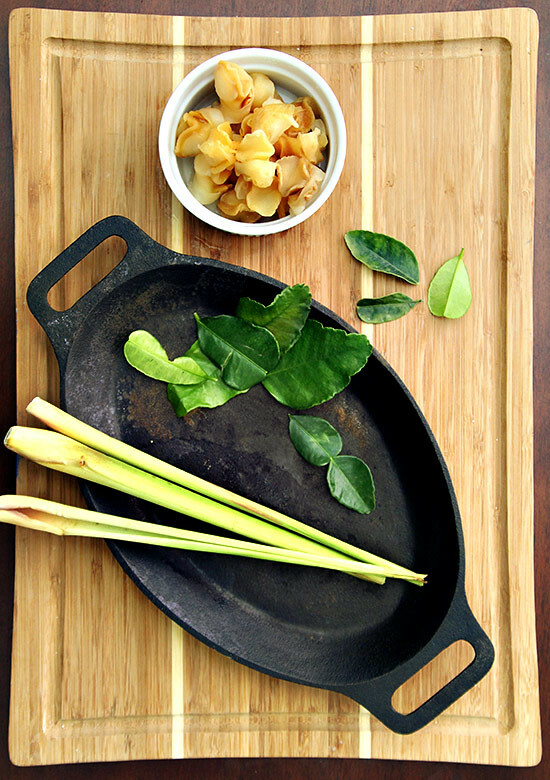 But that’s not all folks, add to that fragrant lemongrass and citrus scent of kaffir lime leaves, it’s easily the most aromatic and texturally interesting type of chả of all. In mixing bowl, combine all the ingredients and mix well. 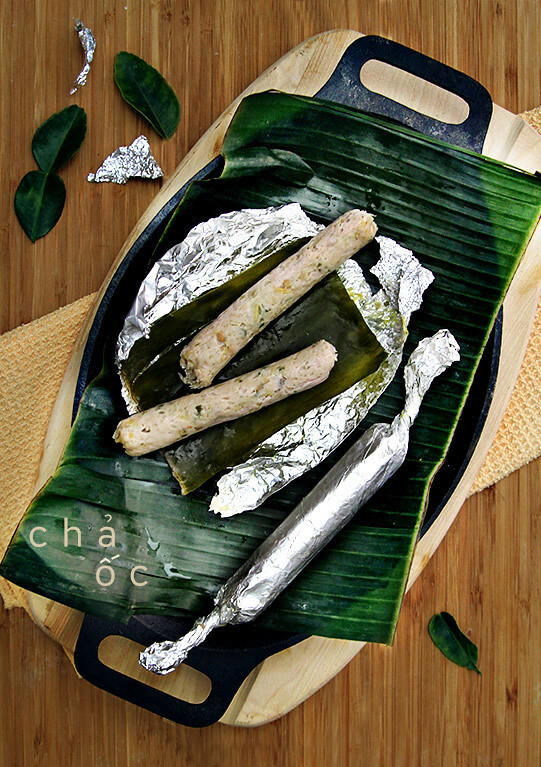 Lay banana leaf on one side of aluminum foil and place about 2 tbs of the mixture onto the banana leaf. Mold the mixture into a log and roll tightly roughly, dime size thickness. Seal the ends one at a time by twisting the foil. Bring a steamer to boil. Add the uncooked cha oc into the steamer tray and steam about 10-12 minutes. Enjoy as a snack hot or cold, or pan fried with touch of oil until golden brown. Cooks note: Giò sống , uncooked pork paste can be purchased in the refrigerated or frozen section of most Asian markets--we like the brand with the laughing pig. It's typically already seasoned so we account for that by adding only 2 ts of fish sauce, but check the particular brand. 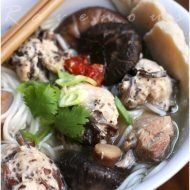 This is our entry to Delicious Vietnam, a monthly blogging event to celebrate Vietnamese cuisine created by Anh of Food Lovers Journey and ourselves! 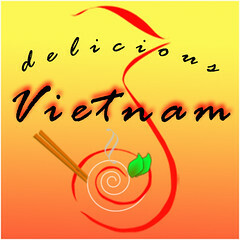 This month, Delicious Vietnam is hosted by Angry Asian Creations. Please submit your posts to Lan at angryasiancreations[at]gmail.com by July 10, 2011. Thank you Hong and Kim for the delicious recipe! I definitely will have to try it! Darn accents! Let’s just call it poetic license in the video to make a joke out of it! Do let us know how it goes! It’s very much like chao-tom with the shrimp paste? Looks delish–thanks for the video clip too! I love your website and have tried quite a few of your recipes. I love them all. Thank you for doing what you do. Hong and Kim, you guys are Awesome!!! thank you so much Jen…it is like a part time (sometimes feels like full time job) but we love that people are inspired to cook more and learn more about Vietnamese food via our blog. I just made them. It was so good. My whole family love it. Yum Yum Yum! Thank you for taking the time to inspire people to cook! That’s fantastic to hear! So glad you family enjoyed them. Got any left?! I’ve never tried cha oc, but it sounds exquisite. I bet the kafir lime and lemongrass do wonders for the cha! I am going to try since this is my husband and dad’s favorites. Thanks you guys! I also get confused with Vietnamese accents lol! Just discovered your wonderful how to videos. Great job! How beautiful these look! I just want to gnaw on a few right now. I had no idea periwinkles were even mixed in with the pork. those are definitely not common pairings, but we think it works! Fantastic way to combine snails and pork. I am going to try your recipe soon. definitely let us know how it goes! Let me first begin with how I love your website. Every minute and article I read takes me to my childhood and memories of the food my grandparents make in Vietnam. My mom knows a lot of Vietnamese recipes but there were some that were lost that I found here. The more I read the more I crave and now I can make these dishes Thanks! where can u get the kaffir lime leave? Do they sell it at an asian market? I made 50 of these for my birthday and it was a big hit! Thanks for the recipe, Hong and Kim. 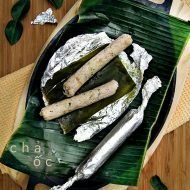 I skipped the aluminum foil and only used banana leaves, I loved how the aroma of the banana leaves infused into the cha oc…This is such an excellent dish!